The principle of creating a second runway at Gatwick Airport was today (Friday) welcomed by West Sussex County Council’s leader Louise Goldsmith in a special interview with the editor-in-chief of this newspaper group, Gary Shipton. Nearly 35 years after the local authority signed a legal agreement restricting the airport to just one runway, Mrs Goldsmith has made clear her and her council’s support for full airport expansion following a major debate in the council chamber this morning. She said the county could not be preserved in aspic – if it was to continue to provide quality jobs for its young people as well as take seriously its responsibilities to an ageing population, it had to make economic growth a priority. But that did not mean abandoning the environment. Quite the reverse. “I have always considered myself to be an environmentalist, and protecting everything that makes West Sussex a unique place of beauty in which to live, work, and visit, remains enormously important,” she said. “By making our position clear now in a positive way we have the best opportunity of ensuring that we mitigate environmental concerns as much as we possibly can,” she said. This would be achieved by setting up one if not more special consultative Boards with partners to investigate and tackle key concerns. She was also committed to ensuring that airport expansion brought with it the right type of infrastructure for the county – maximizing West Sussex’s ability to do business and remain a great place to live by improving roads and facilities. Her forthright and unequivocal statement came as Gatwick Airport submitted its planning proposals for expansion. A final decision on them will be taken by central Government – and not local authorities – and there is no guarantee that Gatwick will win the argument even with the county council’s support. But Mrs Goldsmith believes that they are best equipped to influence the outcome if they make clear their position now. “I think there are several issues for us. Obviously people will want to see what our opinion of a second runway is. In stating our position it is very good to open up the debate because there is a big debate to be had, but it is also about stating our direction of travel. We’ve taken our time to come to this position. We recently commissioned research into residents’ and businesses’ attitudes to airport expansion and we’ve previously commissioned experts to look at the economic and employment impact for West Sussex of having a second runway at Gatwick or expansion elsewhere. We know we have got to go for growth in West Sussex. It’s the right thing. The whole country needs growth and we’ve got to play our part in that. “Of course, with that growth comes the two elements of infrastructure and the environment; they are equally big and people are going to be impacted and they are going to be worried about that. And one of the best reasons for coming out early is not only to acknowledge and listen to their comments but also to start planning and preparing if this does happen what can we do to mitigate them. “When I saw George Osborne at the CBI dinner in London it was all about growth for England, growth for the UK and that is how we are going to get out of the dire economic situation. We’ve all got a part to play and we do want a vibrant economy here. This is one of the best places in the world to live, we need to make sure we have got that strong economy and it’s really important for ever person to play their part. She said there were real potential risks for West Sussex if the expansion did not go ahead. Not only would it put in jeopardy future economic growth – but could diminish current levels of activity as Gatwick became more marginalized by expansion elsewhere. “It’s a really serious consideration. A declining airport would be a declining economy and that is something we have to take into consideration. But that’s why it’s even more important that we have come out with the position that we have. I would rather be looking at expansion than managing contraction. “Yes, this county is fantastic. We have got a world class airport, world class car manufacturing with Rolls Royce, we’ve got Ricardo that makes superb engines … businesses say they like to come to West Sussex it’s a beautiful place and we want them here and we want them developing and providing those jobs for our youngsters to enable them to continue to stay here. “We have got an elderly population too, we need to grow to ensure we have got a balanced West Sussex. “In 20 years’ time, I don’t want the county to look back on a missed opportunity. By engaging positively in this process at this time we really can secure the best economic outcome for all our residents – while mitigating the worst impacts on our environment,” she said. West Sussex County Council approved a motion supporting ‘in principle’ a second runway at Gatwick today (Friday July 19). Gatwick Airport is making its submission to the Airports Commission today and will publicly reveal plans on Tuesday, which are expected to include a second runway. While some in the chamber felt that the motion was premature and should be deferred to allow members time to look at Gatwick’s submission, the vote was carried by 42 to 10 with 12 abstentions. Louise Goldsmith (Con, Chichester West), leader of WSCC, said: “The world grows increasingly competitive and West Sussex County Council must rise to the economic challenge or be left behind. She and Pieter Montyn (Con, The Witterings), cabinet member for highways and transport, who proposed the motion, told the audience that their support was ‘in principle’ and they would do their best to negotiate measures for infrastructure improvements as plans progressed. Graham Jones (UKIP, Felpham) said two days notice was not enough to give a considered view on a second runway at Gatwick, and thought it would be a disservice on the people who elected him to give an opinion at such short notice. However Dr Walsh berated the UK Independence Party for not coming up with a position on Gatwick and said they ought to be ‘ashamed’ to a chorus of loud cheers. During the meeting county councillors from Crawley expressed their disquiet at the impact a second runway might have on the environment and housing in the town. Proposing deferral Michael Jones (Lab, Southgate & Crawley Central) expressed his surprise that in a space of a week a long held policy of the council to oppose a second runway had ‘evaporated’. He said that plans would fundamentally change the lives of the people in the county forever, but his motion was defeated. Bob Lanzer (Con, Maidenbower), also leader of Crawley Borough Council, said he would be abstaining from the motion, and while he made it clear he did not support a second runway, he was pleased to see the county council’s willingness to engage in order to mitigate possible environmental and infrastructure problems. Meanwhile Bill Acraman (Con, Worth Forest) predicted a mega city in the north of Sussex equal to the size of Brighton, stretching across the north of the Horsham district, sprawling from Broadfield in Crawley to Forest Row. He added that the A264 and A272 would probably need to be brought up to motorway standard, and asked whether the infrastructure improvements needed would ‘magically appear’. Councillors have backed a second runway at Gatwick Airport, fearing a loss of 10,000 jobs if a new hub for London is built in the Thames Estuary. West Sussex County Council (WSCC) voted in favour of the expansion of Gatwick as part of the solution to increase the UK’s airport capacity. WSCC leader Louise Goldsmith said an estuary airport would see business move away from both Gatwick and Heathrow. Residents against Gatwick’s expansion said the vote was in “unseemly haste”. The council’s support for the second runway at Gatwick came on Friday, the final day for submissions to the Davis aviation commission. Gatwick’s submission includes the airport’s preferred location for a second runway, which is to be made public on Tuesday. It has engaged leading architect Sir Terry Farrell. London Mayor Boris Johnson’s three proposals to the commission include a four-runway hub on an artificial island in the Thames Estuary, previously dubbed Boris Island. He also proposed a hub on the Isle of Grain in Kent or expanding Stansted airport. 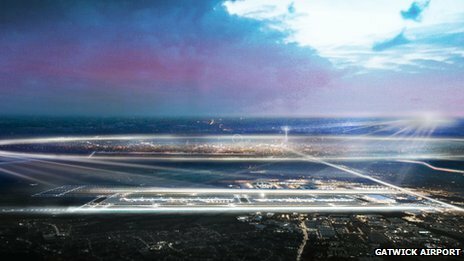 Heathrow has proposed three options for a new runway in West London and Surrey. Ms Goldsmith said a Thames Estuary airport would be a “terrific issue” for Heathrow and Gatwick. “We would see businesses moving away,” she said. “In some of the statistics about business shifting away we could be losing 10,000-plus jobs. Ms Goldsmith said the council needed a mandate in the discussions ahead about the future of the South East’s airports. “We will have no influence whatsoever as strategic planning authority on what is decided but we do have a voice,” she said. “We believe we need a very strong economy in West Sussex. Gatwick Area Conservation Campaign has long opposed a second runway at the airport. It believes the plans will cause widespread blight, with tens of thousands of pounds knocked off the value of thousands of people’s houses in Sussex and Surrey towns as far afield as Dorking, Reigate and East Grinstead. Vice chairman Peter Barclay said the WSCC vote was premature. “We consider it was an appallingly rushed debate with two days’ notice,” he said.